I've updated all the information on the War Of The Worlds: Goliath page, including my own review. Now that War Of The Worlds: Goliath is available on disc, there are many new reviews online. It looks like it's getting some mixed reviews, but more favourable among the sci-fi related sites. If you haven't been following the WotW:G Facebook page, there's some great links there. Or here are a few select ones from Blu-rayDefinition, Fangoria, Technology Tell, Beyond Hollywood, and UpcomingDiscs. War Of The Worlds: Goliath is now available in stores on Bluray and DVD! I'm having a bit of a hard time finding it in my area, but hopefully more stores will fill up soon, and I'll update my page as soon as possible. War Of The Worlds: Goliath is in theaters starting today! You can see War Of The Worlds: Goliath in 18 locations for a week starting this Friday, March 7th! The states that have the movie in 2D are North Carolina, Texas, Kansas, Missouri, Indiana, Oklahoma, Florida, Alabama, and New Mexico. You can also see it in 3D in Los Angeles and New York City. See the Facebook post for exact details. The features that will be on the War Of The Worlds: Goliath DVD and Blu-ray have been posted on the WotW Facebook page. February 02, 2014 - NEWS - War Of The Worlds Release Date! Finally War Of The Worlds: Goliath has it's North American release dates! The movie will first see a limited (15-20 screens) theatrical release on March 7th! Location details will come in the next couple of weeks. Then on April 1st, it will be released on 3D/2D Blu-ray, DVD, and Video On Demand (Netflix, iTunes, cable, and many others). This site has been very quiet, but there are some interesting things happening with Heavy Metal. Variety has the details. War Of The Worlds: Goliath was recently shown at the Boston Sci-Fi Film Fest, and won the award for Best Animated Feature. I've updated the newest sales information. Reviews continue for War Of The Worlds: Goliath, which seem to be similar to the previous reviews I mentioned. You can check out some of them here, here, here, here, here, here, and here. The general consensus is that the movie looks good, sounds good, and is well designed. But the story and character development are very simple, and is a bit rough technically with voice acting and some animation. However, overall the movie is well received and entertaining, as long as you're not expecting anything too deep. Reviews are starting to show up for War Of The Worlds: Goliath. It looks like it's getting mixed reviews. You can check out some of them here (starts 01:08:35), here, here, here, here, and here. Some of the positives are that it has good looking backdrops and machine animation, good 3D, good pacing, and great battle scenes. Some of the negatives are that it has too much action, needs more character development and emotion, a little too much over the top, poor character animation, cheesy dialogue, and poor open ended ending. Also, according to an interview with Digital News Asia, it looks like WotW:G won't be getting it's wide theatrical release in North America, like we hoped. Depending on how well the movie does in Malaysia, we'll probably see a limited theater release in North America before going to DVD/Blu-ray and Video On Demand. War Of The Worlds: Goliath is coming soon in Malaysia, on November 15th! To tide you over, check out some interviews with Slice of SciFi, Business Circle, BFM Business Station, another BFM Business Station, and a behind-the-scenes video from Imaginex Studios. Listen to a Malaysian radio interview with War Of The Worlds: Goliath's producer, Leon Tan. Thanks to a submission from Vertigo Mindwarp, check out some Heavy Metal themed sounds he put together for Windows sound events. War Of The Worlds: Goliath was shown at the Los Angeles 3D Film Festival on Saturday, and won for Best 3D Animated Feature Film! It beat out Madagascar 3, ParaNorman, and Tinker Bell: Secret Of The Wings. According to Digital News Asia, WotW:G will be shown at Spain's Sitges Film Festival, October 13th. Update September 27, 2012 - Updated this news with more info. War Of The Worlds: Goliath will be shown at the Los Angeles 3D Film Festival this Saturday, September 22nd. Added a link to fred's HM fan blog, where you can read a lot of great magazine reviews. Comments on the screening of War Of The Worlds: Goliath are starting to trickle in on the Facebook page, and it looks like the movie was a hit! Visit the official site to view the latest trailer for War Of The Worlds: Goliath. Red Dot Diva has an interview with War Of The Worlds: Goliath writer David Abramowitz. June 13, 2012 - NEWS - War Of The Worlds Screening In San Diego! War Of The Worlds: Goliath is just finishing up, and July 14th (same time as the Comic-Con) it will be screened in full 3D in San Diego! Ticket info to come soon. Stay tuned to the facebook page. The 24th blog is up, for the War Of The Worlds: Goliath movie, which includes an interview with the writer David Abramowitz. The 23rd blog is up, for the War Of The Worlds: Goliath movie, about their road to 3D. 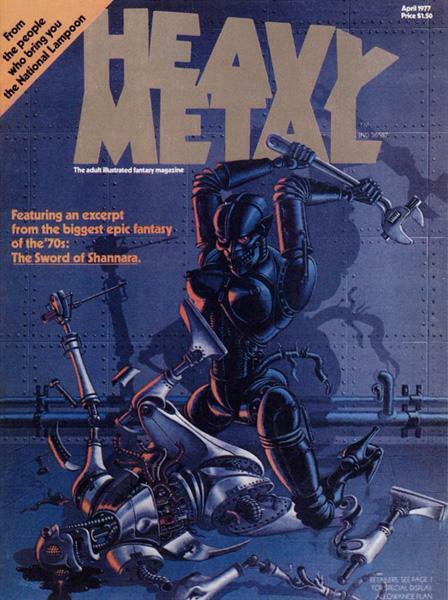 I started this Heavy Metal Magazine Fan Page on November 12, 2001. Now, 10 years later, I've decided to semi-retire the News portion of my site. I will also be removing any future unreleased projects, such as movies and games. I will also stop posting new issues of the magazine. The majority of the rest of my site will remain the same, focusing more on the history of Heavy Metal, rather then the future of the franchise. The reason for this change is that I'm looking to free up some of my own free time. I love doing this site. It's a hobby I enjoy. But keeping this site updated does take up a lot of time. However, my site won't be completely abandoned. By freeing up my updating time, it will give me more time to tidy up or expand the rest of my site. I may also add new things from time to time after they're released, such as new movies, or magazines. 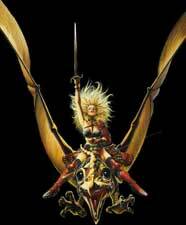 In the world of Heavy Metal, there are many things to look forward to, such as movies. Of course the new Heavy Metal movie with Robert Rodriguez, that has been quiet since the announcement in July. Metal Hurlant Chronicles is also quickly coming up (check out the newest trailer). It still needs to find a home in North America though. Europe will start seeing it April 2012. I'm not sure what's happened to the Barbarella remake. It's been quiet for over a year, and was in slow development even before then. Although Captain Sternn looks promising, as it's currently developing a 3 minute trailer to promote to studios. Fistful Of Blood has also been quiet for the last year. Although there's a new movie recently announced, called Sundown Seven. Could this be the same project, just updated? It will also have a graphic novel published by Heavy Metal at some point. And of course there's War Of The Worlds: Goliath. This is the one project I will keep posting news on, until it's released, which should be mid-2012. Sorry, I've been a bit slow on the news front lately. Some new info on War Of The Worlds: Goliath is that Epic Pictures has picked up the movie for European and North American sales, set to release mid-2012. You can check out a new updated trailer for the movie on their site. Also, Mark Sheppard (Battlestar Galactica, Supernatural) has been added to the cast. Check out the WotW Facebook page for a lot of great new images and info. The 2012 Heavy Metal calendars are now availble. What is this? I have no idea. But there it is. I've updated the information for the new issue of Heavy Metal, November 2011. The new issue of Heavy Metal is out. November 2011 is now available. HeavyMetal.com has some sample pages from it. 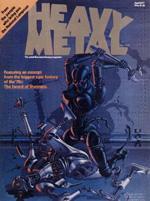 I've updated the information for the new issue of Heavy Metal, September 2011. With Robert Rodriguez having the rights to the new Heavy Metal movie, it means that it will be something different, and all the previous ideas for the movie don't go with it. However, we now get to see a glimpse of what it might have been like. Check out some concept art on writer Neal Asher's blog. The new issue of Heavy Metal is out. September 2011 is now available. HeavyMetal.com has some sample pages from it. There was another big movie announcement at the Comic-Con. Set for a release date of 2012, Zombie Apocalypse will be a trilogy, along with a game, and a graphic novel published by Heavy Metal. All pictures on this site are for information, and non-profit use, and most are used without permission. All opinions are my own, unless otherwise noted. If you have any questions or concerns about this site, you may email me - Lostboy.